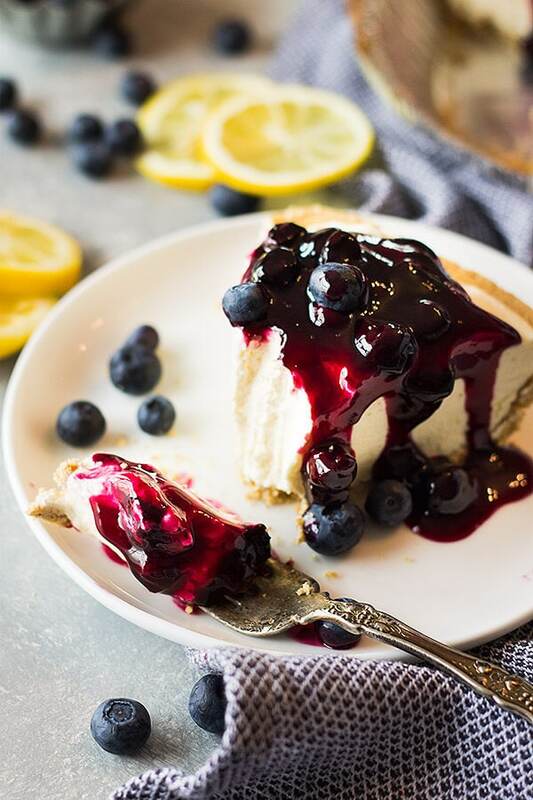 This creamy, light and fluffy Lemon Blueberry No Bake Cheesecake recipe is the perfect springtime dessert and hooray for not turning on the oven! 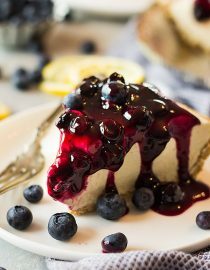 Hi everyone, it’s Malinda from Countryside Cravings stopping in with this luscious lemon blueberry no bake cheesecake. I have been having thoughts of spring and when I think spring I instantly think lemon! I don’t know why, I just do. So, with those thoughts I had the urge to make a dessert using…..you guessed it….lemon. 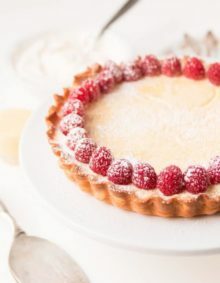 I wanted to make an ultra easy dessert because I was short on time and didn’t want to be in the kitchen forever so I scavenged my pantry to find a store bought graham cracker crust. YES, I had one! How Long Will Graham Cracker Crust Last? I think that it would be great for at least a couple weeks if stored in a cool, dry place. You can store it in your freezer until you are ready to use it in a recipe. 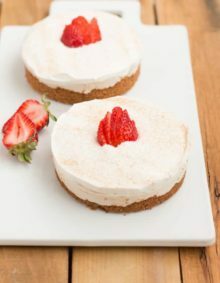 I don’t mind taking a little help from the store from time to time but if you prefer to make this cheesecake strictly homemade then just make a 9″ graham cracker crust. Now for the ultra creamy filling. 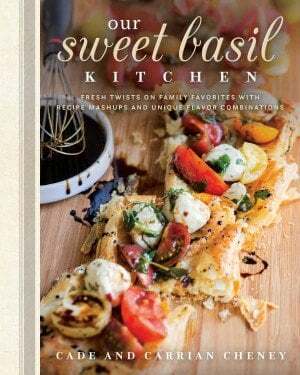 It starts with softened cream cheese. Just a note- your cream cheese needs to be very soft in order to get that smooth texture. I like to leave it out on the counter to soften but if I am in a really big hurry I will warm it slightly in the microwave. Don’t judge, just giving you the real me here folks. To flavor this cheesecake I used my homemade lemon curd (plus I had some extra in the fridge just waiting to be used). It gives it a nice lemony punch without being to tart. If making homemade lemon curd isn’t your thing then don’t be afraid to use the store bought. I just really recommend trying the homemade version though, I promise you won’t be sorry!! Can Cheesecake be Left Out? Cheesecake should not be left at room temp for more than 6 hours max and that’s a real stretch. Foods made with eggs and milk such as pumpkin pie, custard pie, and cheesecake, must be refrigerated after baking. Now, when it came time for the blueberries I debated for a long time. I couldn’t decide if I just wanted to leave the blueberries fresh and fold them in, sprinkle them on top or go a different direction and make a topping. Well, as you can see I decided to go with a topping and I’m so glad I did. 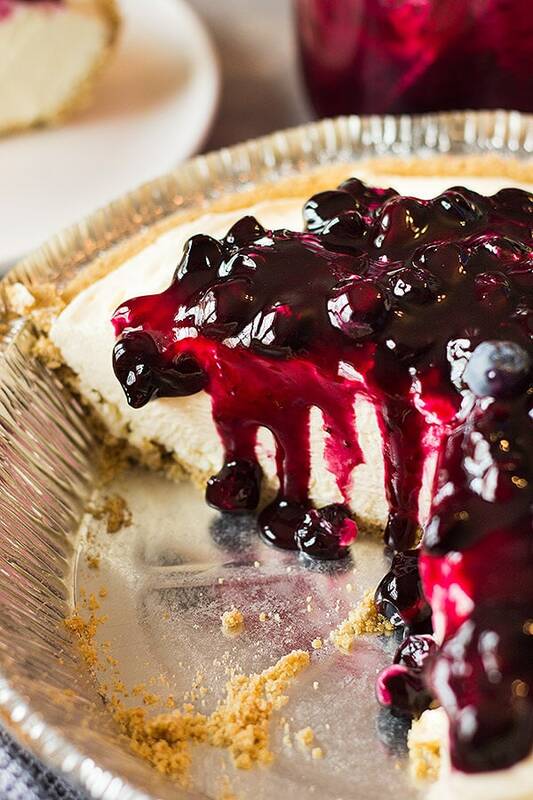 Don’t worry the blueberry topping couldn’t be easier to make either. Remember I didn’t want to spend all day making a cheesecake! You will just need a few simple ingredients like water, sugar, cornstarch, lemon juice (fresh is best!) and fresh or frozen blueberries. You will simmer everything for about 5 minutes and this will give you a nice thick blueberry topping. (It’s also great on pancakes or by the spoonful, just saying!!) Let it cool in the refrigerator while your cheesecake is setting up then use it to top your cheesecake when you are ready to serve. 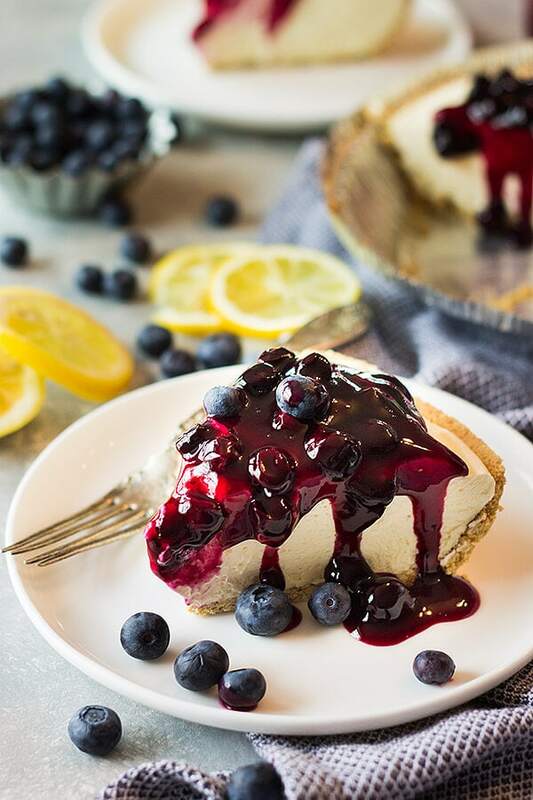 So, if you are intimidated by making a traditional baked cheesecake give this lemon blueberry no bake cheesecake a try. 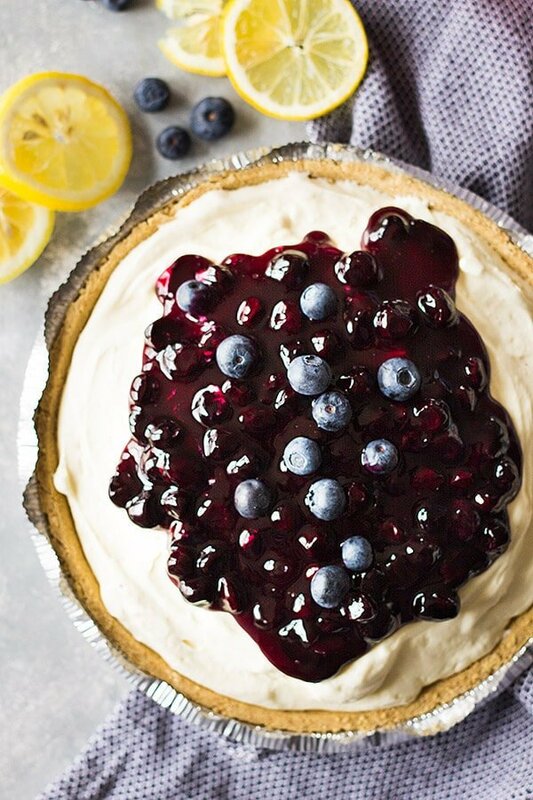 I promise you won’t be disappointed because with the vibrant lemon and sweet blueberry topping all in one creamy slice, I ask you what’s not to love??!! In the bowl of your stand mixer beat the heavy whipping cream until stiff peaks form. In a separate bowl beat the cream cheese until smooth. Add in the lemon curd, powdered sugar and vanilla and beat until well blended. Spoon into the prepared crust and smooth the top. Place in the refrigerator for 4 hours to chill. While the cheesecake is chilling combine the water, sugar and cornstarch in a small saucepan. Add in the blueberries and lemon juice. Simmer over medium to medium low heat for 5 minutes. Pour into a heat safe container and place in the refrigerator to cool. 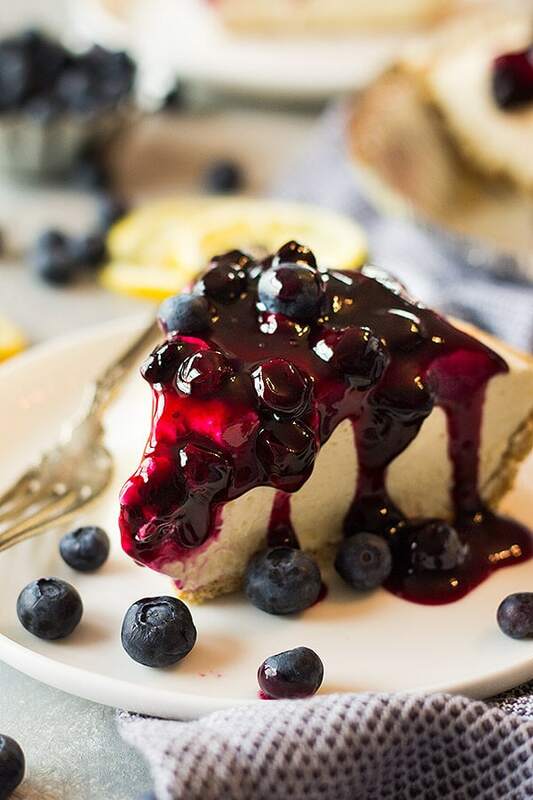 When ready to serve the cheesecake top with cooled blueberry topping. Prep time reflects chilling time in the refrigerator. 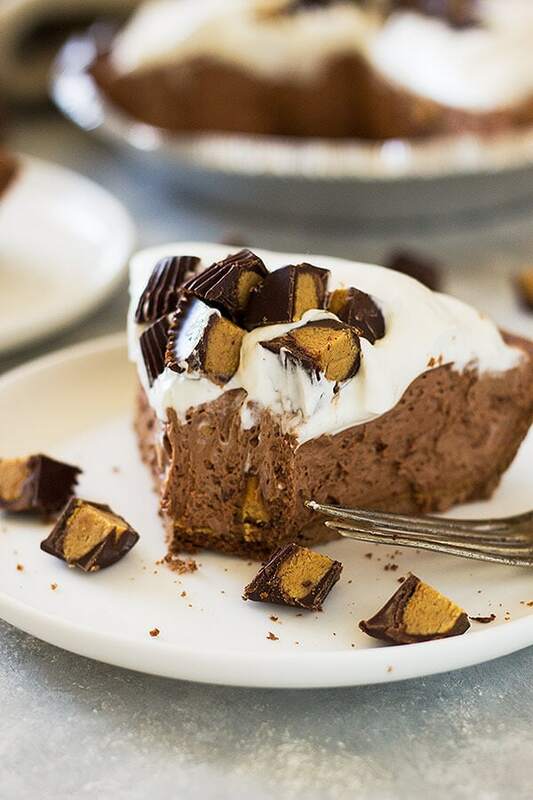 Do we even need to say anything about this no bake cheesecake? It’s all of your favorites in one slice. 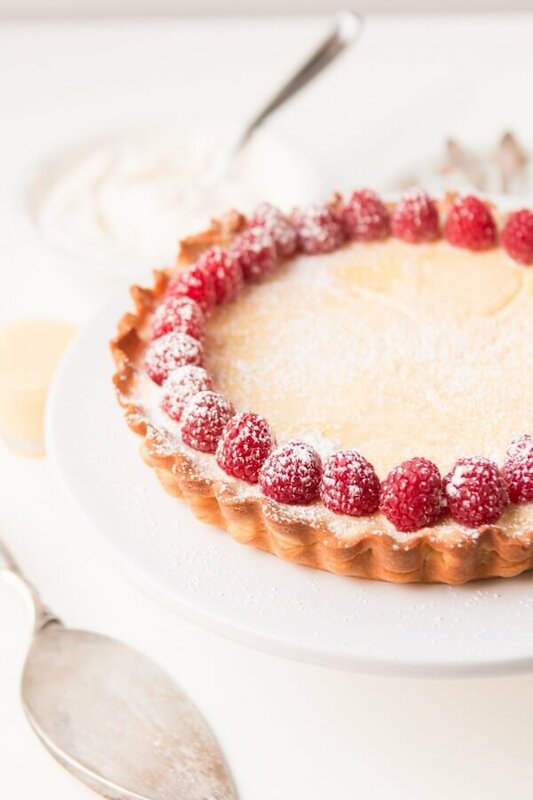 Raspberries, lemon curd and the perfect tart crust, oh and did I mention cheesecake?! This made our day, Ashley!! Thank you! So glad you enjoyed this recipe! 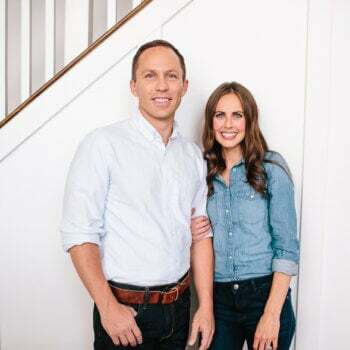 It is one of our favorites! I read about lemon curds. 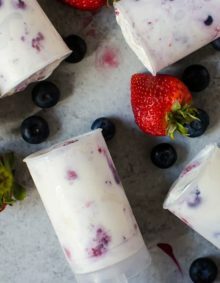 What are they and if I make them myself, what is the recipe? Or where do I find them in the store? This recipe looks so very delicious. I love anything lemon and then add blueberries, that’s heavenly. Thank you for your advice and recipe. 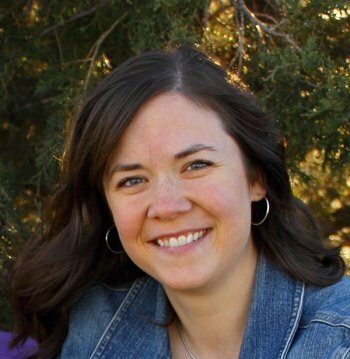 Hi Marian! You can find lemon curd along with the jams and jellies if your grocery store carries it. Otherwise I have a link in the text above for a homemade lemon curd. I hope you enjoy and thanks for asking!! I have been craving cheesecake something mad and this is going to feed right into that craving. I guess I’m just going to have to break down and make it. Do it! haha, cheesecake is never a bad thing!